Hassan-i Sabbāh, or Hassan aṣ-Ṣabbāḥ (c. 1034 - 1124), was a Persian Nizārī Ismā'īlī missionary who converted a community in the late eleventh century in the heart of the Alborz Mountains of northern Iran. He is recognized as the founder of what became Nizari Ismailism, supporting Nizar and his successors as the Ismaili Imam in opposition to the 9th Fatimid Caliph-Imam. Hassan acquired the fortress of Alamut as his headquarters in 1090, where he remained until his death. About 20 other fortresses as well as several towns were later added to geographically fragmented territory known as the Nizari State. Seven "Lords of Alamut" succeeded Hassan as rulers of this territory. During Hassan's rule, the Ismaili Imam remained "Hidden." Hasan (and his first three successors) were regarded as the chief representative of the Imam (Hujjah, or proof of the Imam). They were supreme leaders of the scattered Ismaili community. (It was during the rule of the fourth Lord of Alamut that Imam Hasan I announced his "resurrection.") Hassan was renowned for his piety and ascetic life-style as well as for his skilled leadership. 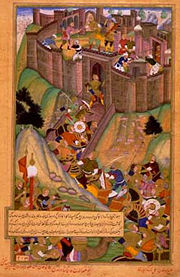 Despite attempts by much stronger armies to defeat Alamut and his other castles, Hassan and his followers successfully defended their fortresses. Alamut fell to the Mongols in 1256. Surrounded by enemies, Hassan dispatched teams of trained assassins to eliminate people who were either believed to be a danger to the security of his state, or to Ismailism's survival. The first victim was the powerful Seljuq vizier, Nizam al-Mulk (1092). Originally friends, Hassan and al-Mulk had started feuding as early as 1076. Due to legends surrounding use of hashish, Hassan's agents became known as the Hashshashin. Apologists prefer to describe these missions as covert military operations against a superior foe, rather than as illegitimate acts of terror. Yet, without Hassan's Nizari state, Ismailism may have withered away and died. Today, this version or school of Islam has a vital bridge-building role to play in promoting religious tolerance and dialogue; it strongly affirms the truthfulness the three Abrahamic religions, which are increasingly acknowledging their shared spiritual riches. Only by overcoming the pains and prejudices of past eras, then moving forward together to build a world of peaceful and justice can the ultimate goal of all these religions be fulfilled. Hassan ibn Sabbā was born in the city of Qomm or Qumm, in Persia in 1056 to a family of Twelver Shi'a Islam. Legend traces his lineage back to the "ancient H`imyaritic kings of Southern Arabia." Early in his life, his family moved to Rayy, about 120 kilometers (75 miles) from Iran’s modern-day capital city of Tehran. Rayy had functioned as a center of Ismaili preaching "since the ninth century, and it was not long before" Hasan was influenced by Ismaili doctrine. Ismailis believe that their Imam possesses the key to unlock the hidden, or inner, meaning of the Qur'an. The Ismā‘īlī Mission or Da‘wa worked on three layers: the lowest was the foot soldier or fidā'ī, then the rafīk or "comrade," and finally the Dā‘ī or "missionary" (plural: Daˤiyyīn). Progress up the hierarchy involved initiation, oaths, and acquisition of esoteric knowledge. Hassan came to regard one of the Comtades, Amira Zarrab, as his mentor, although he initially unimpressed, since "it had never entered" his "mind that truth should be sought outside Islam" and he regarded the Ismailis as drawing on foreign ideas, which he dismissed as "philosophy," then "a term of abuse among the pious." However, as he continued to meet with Zarrab, participating in many passionate debates on the merits of Ismā‘īl over Mūsā, Hassan's respect grew. Impressed with Zarrab's convictions, he decided to delve deeper into Ismā'īlī doctrines and beliefs. Soon, he began to see merit in declaring his loyalty to the Ismā‘īlī Imam. Finally, after a severe illness when he thought he was going to die but didn't he decided to embrace Ismaili beliefs before he did die and it was too late to attain "the truth." He converted, and swore allegiance to the Fatimid Caliph in Cairo. Hassan's studies did not end with his conversion. He continued to study under two other teachers and as he proceeded on his path, he gained respect within the Ismaili community. In 1072, the chief Dai for the region visited Rayy, appointed him Deputy Missionary and advised him that he should present himself at the Caliph's court. Hassan, however, did not go to Cairo until "several years later." Some historians have postulated that Hassan, following his conversion, was playing host to some members of the Fatimid caliphate, and this was leaked to the anti-Fatimid and anti-Shī‘a Nizam al-Mulk, later vizier to the Seljuk sultan. Another story has Hassan, al-Mulk, and the poet, Omar Khayyam studying together as friends then falling out. Apparently under threat from al-Mulk, Hassan left Rayy in 1076. He still did not head straight for Cairo. He traveled first to Isfahan, then North to "Azerbajyan then from there to Mayyafariqin where "he was driven out of town by the Qadi (Sunni state-appointed judge) for asserting" that only the Imam had the right to interpret Islam. He then turned south and traveled through Iraq, reached Damascus in Syria. He left for Egypt from Palestine. Records exist, some in the fragmentary remains of his autobiography, and from another biography written by Rashid ad-Din Tabib in 1310, to date his arrival in Egypt at August 30, 1078. It is unclear how long Hassan stayed in Egypt: about 3 years is the usually accepted period of time. He continued his studies here, becoming a full Missionary. While he was in Cairo, studying and preaching, he upset the highly excitable Vizier, Badr al-Jamalī, who at the time was de facto ruler—the office of caliph was symbolic but politically weak. It is also said by later sources that the Ismaili Imam-Caliph al-Mustansir informed Hassan that his elder son Nizar would be the next Imam. al-Mustansir is said to have initially designated Nizar as his successor. However, al-Jamali's son and successor as vizier, al-Afdal, preferred Qasim Ahmad, Nizar's younger and more compliant half-brother. When al-Mustansir died, claiming that al-Afdal al-Mustansir had switched the designation before he died, placed Qasim Ahmad on the throne. Fleeing to Alexandria, Nizar was proclaimed Imam there. In 1095, he was defeated by the Vizier, taken to Cairo and executed. (Nizar's son, al-Hādī ibn Nizār, later escaped to Alamut, Hassan's fortress, where the Nizari line of Imams continued until Alamut fell in 1256.) 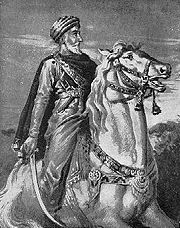 Hassan himself was briefly imprisoned by Badr al-Jamali. The collapse of a minaret of the jail was taken to be an omen in the favor of Hassan and he was promptly released and deported to North Africa. However, the ship that he was traveling on was wrecked. He was rescued and taken to Syria. Traveling via Aleppo and Baghdad, he returned to Isfahan in 1081. Hassan’s life now was totally devoted to the Mission. There is hardly a town in Iran which he failed to visit. Increasingly, however, he focused his attention on a mountainous area to the north of Iran, and touching the south shore of the Caspian Sea. These mountains were home to a people who had traditionally resisted all attempts at subjugation. It was in these mountains, in the region of Daylam, that Hassan chose to pursue his missionary activities. He took up duties as Chief Missionary of the area, sending personally trained missionaries into the rest of the region. The news of his activities reached Nizam al-Mulk, who dispatched soldiers with orders for Hassan's capture. Hassan evaded them, and went deeper into the mountains. His search for a base from where to guide his mission ended when he found the castle of Alamut, in the Rudbar area, in 1088. As a supporter of Nizar, Hassan had now repudiated the claims of the Fatimid Caliph to be Imam, and was interested in finding a permanent base from which he could support the true Imam. He may already have developed a military ideology of ridding Islam of illegitimate, heretical rulers who did not recognize the authority of the Imam. To prosecute this policy, a "remote and inaccessible stronghold" was ideal. Daftary says that he planned to "launch an open revolt against the" Seljuqs and describes his movement as "revolutionary" in intent. Alamut was a fort that stood guard to a valley that was about fifty kilometers long and five kilometers wide. The fort had been built about the year 865; legend has it that it was built by a king who saw his eagle fly up to and perch upon a rock, of which the king, Wah Sudan ibn Marzuban, understood the importance. Likening the perching of the eagle to a lesson given by it, he called the fort Aluh Amut: The "Eagles Teaching." Hassan employed an ingenious strategy to take overt the fort. His plan took the better part of two years to effect. First, he send sent his Daˤiyyīn and Rafīks to win the villages in the valley over to Islmailism. Next, key people were converted and in 1090, he was peacefully able to occupy the fort. It is said that Hassan offered 3000 gold dinars to the fort owner for the amount of land that would fit a buffalo’s hide. The term having been agreed upon, Hassan cut the hide into strips and joined them all over along the perimeter of the fort. The owner was defeated. (This story bears striking resemblance to Virgil's account of Dido's founding of Carthage.) Hassan gave him a draft on the name of a wealthy landlord and told him to take the money from him. Legend further has it that when the landlord saw the draft with Hassan’s signature, he immediately paid the amount to the fort owner, astonishing him. from now "until the time of his death thirty five years later," Hassan "never once went down from the rock. He spent the next 35 years studying, translating, praying, fasting, and directing the activities of the Daˤwa (mission, or preaching). This mission became known as the "new preaching." He was recognized by Islmailis throughout Iran and Iraq as the chief representative of the Imam (Hujjah, or proof of the Imam) who was at least for the time being Hidden. Nizar's son or grandson may have been living under Hassan's protection in Alamut but it was not until Hasan II revealed himself as Imam in 1164. This is known as the "resurrection" (Qiyamat). Under Hassan, Alamut was the center of Nizarī Ismailism. He knew the Quran by heart, could quote extensively from the texts of most Muslim schools, and apart from philosophy, he was well versed in mathematics, astronomy, and alchemy. Hassan found solace in austerity and frugality. A pious life, for him, was one of prayer and devotion. According to tradition, Hasan's austerity extended to dislike of music. He is said to have banished someone for playing the flute and to have executed his own son for drinking alcohol. Hassan is himself credited with developing the "new preaching" which he set out in a treatise called The Four Chapters, which has not survived intact. Daftary describes Hassan as "a learned theologian." Hassan, known as "sayyidna" (our Lord) was the first of eight Lords of Alamut, who ruled over a small state, often referred to as the Nizari State, until the Mongol conquest of 1256. Hassan extended the territory under his control, acquiring 20 castles spread across parts of Iran and Syria mainly in mountainous areas. Some were acquired through diplomacy, some by military means. Several towns were also within the Nizari state. In 1096 or 1102, Hassan's followers under the command of Kiya Burzurgimid famously captured the "castle of Lamasar" which was "strategically situated on a rounded rock overlooking the Shah Rud" and "confirmed the power of the Ismaili in the whole Rudbar area." Despite the distances between different fortresses, each headed by a Dā‘ī, the territory had its own mint, "maintained its cohesion," and was recognized as a "state". Islamic law was in force throughout the state. Despite many efforts by the Seljuqs, the Nizari state maintained its independence. In 1092, the Seljuqs launched two expeditions against Alamut, which then accommodated Hassan and "no more than 60 or 70 men." During the siege, some 300 Nizar supporters launched a "surprise attack" on the Seljuq army, which fled. The Nizari enclaves were also viable economical entities, says Daftary, "utilizing highly ingenious techniques in their water supply and fortification systems." From Alamut and his other fortresses, Hassan sent missionaries to propagate the New Preaching. Also, beginning at about the time of the siege of Alumut, he sent assassins out to eliminate enemies; the first victim was al-Mulk, killed October 14, 1092. Other successful assassinations included the Qadi of Isfahan, the "prefect of Bayhaq and the chief of the Karramiyya, a militant Ismailui religious order" all between 1101 and 1103. Al-Afdal was killed in 1121 although the assassin may not have been an Ismaili. The first incident involving bloodshed probably took place between 1090 and 1092. Several Ismailis were jailed for praying apart from other Muslims (Sunni). They were freed after questioning but then "tried to convert a muezzin from Sava" who "refused to respond to their appeal." Fearing that he would denounce them, they killed him. The leader of this missionary group was later arrested by order of al-Mulk, and executed. The assassins (fida'is) often lost their lives in the process of carrying out their assignments. Daftary argues that it was during the Crusades that stories of their use of hashish to steal themselves for their mission gained popularity; "the Crusaders had been particularly impressed by the highly exaggerated reports and rumors of the Nizari assassinations and the daring behavior of their fida'is, the devotees who carried out these missions in public places" and legends developed around these stories. These included how the assassins were trained, how they were offered "paradise" and drugged with hashish made the final "death-leap." By this process, the Nizari Ismailis came to be "portrayed in Medieval European sources as a sinister order of drugged assassins bent on senseless murder and mischief. Legends about the training of the fida'is, usually described as indoctrination, describe how the future assassins were brought to Alamut at a young age and, while they matured, lived in splendid gardens hidden in the castle where they were secretly drugged with hashish. Hassan, when he visited the garden, was introduced a divine emissary. At a certain point, the drug was withdrawn from them, they were removed from the gardens and flung into a dungeon. There, they were told that if they wanted to return to the paradise, it would be at Hassan's discretion. Therefore, they must follow his directions exactly, up to and including murder and self-sacrifice. It was Marco Polo who took back to Europe the story of the secret garden. Hassan died in 1124, after an illness. He chose Buzurgumid, Dā‘ī of Lamasar, as his heir, instructing him to take care of the state until "such time as the Imam came to take possession of his kingdom." He also appointed three deputies, o ne responsible for propaganda, one for the militia and one as Buzurgumid's right-hand lieutenant. Apart from Hassan's reputation for piety and for scholarship, it is difficult to discuss his legacy without reference to the Assassins, who did carry out successful missions over a century and half. What can be said is that he built up from scratch a state which managed to survive against more powerful enemies for 166 years, during which the Nizaris "succeeded in maintaining an independent state of their own in the midst of a hostile Sunni environment." Until Saladin brought Fatimid rule in Egypt to an end in 1171, they were also opposed by the Egyptian Ismailis. Hassan believed that the Imam was entitled to lead the community politically as well as spiritually and saw his task as building up a secure and stable, if geographically spread state that could eventually protect and support a visible, or Present Imam. This state had many enemies. One of the few, perhaps only, ways in which Hassan and his seven successor Lords of Alamut could protect their state was by covert action. In this view, against enemies who possessed much stronger military capability, known as Asymmetric warfare, Hassan employed unconventional tactics. The Lords of Alamut, though, also used diplomacy, even entering an alliance with the Knights Templar in 1172. Hassan can be credited with ensuring the survival of Ismaili Islam. He and his successors supported Ismaili scholarship and established an infrastructure that continued even after the fall of the Nizari state. This version or school of Islam may have a vital bridge-building role to play in promoting religious toleration and dialogue. Daftary describes Ismailism as recognizing that the same eternal truth is hidden within the three monotheistic faiths, Judaism, Christianity, and Islam. Ismailis have often pursued what Daftary calls an ecumenical approach. The Fatimids, with "occasional exceptions" employed "a policy of tolerance towards other religions and ethnic minorities" which has hardly been equaled under any other Muslim dynasty. Their recent Imams, the Aga Khans, have strongly advocated economic cooperation with people of other faiths, and openness to inter-religious dialogue. ↑ 3.0 3.1 3.2 Lewis (2003), 39. ↑ 9.0 9.1 Lewis (2003), 44. ↑ 10.0 10.1 Daftary (1998), 141. ↑ Daftary (1998), 137; Daftary (1990), xv. ↑ Daftary (1998), 14, 114. Chaliand, Gérard, and Arnaud Blin. 2007. The History of Terrorism: From Antiquity to al Qaeda. Berkeley, CA: University of California Press. ISBN 9780520245334. Daftary, Farhad. 1990. The Ismāʻı̄lı̄s: Their History and Doctrines. Cambridge, UK: Cambridge University Press. ISBN 9780521370196. Daftary, Farhad. 1994. The Assassin Legends: Myths of the Ismaʻilis. London, UK: Tauris. ISBN 9781850437055. Daftary, Farhad. 1998. A Short History of the Ismailis: Traditions of a Muslim Community. Princeton, NJ: M. Wiener. ISBN 9781558761933. Lewis, Bernard. 2003. The Assassins: A Radical Sect in Islam. New York, NY: Basic Books. ISBN 9780465004980. Wasserman, James. 2001. The Templars and the Assassins: The Militia of Heaven. Rochester, VT: Destiny Books. ISBN 9780892818594. Waterson, James. 2008. The Ismail: Assassins: A History of Medieval Murder. Barnsley, UK: Frontline. ISBN 9781848325050.
Review of the book, "The Assassin Legends: Myths of the Isma'ilis (I. B. Tauris & Co. Ltd: London, 1994), 213 pp." by Babak Nahid, Department of Comparative Literature, University of California, Los Angeles. This page was last modified on 4 August 2017, at 15:20.